Evaluation and Action in the Social Environment provides a description of a framework for doing evaluation and action research in social settings. This book presents the strategies for analysis and intervention in community, health, and human service settings. 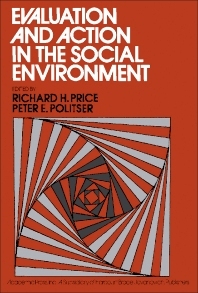 Organized into 10 chapters, this book begins with an overview of the impact of social settings on individual behavior. This text then examines the family, community groups, and personal social networks. Other chapters consider the assessment and change in behavioral and physical environments. This book discusses as well the family as an interpersonal system, with emphasis on interactive sequences to show how symptomatic behavior has its own logic in the family context. The final chapter deals with larger and more complex settings and contexts, including schools, medical hospitals, and settings in the legal system. This book is a valuable resource for sociologists, anthropologists, social scientists, clinical therapists, program evaluators, and social policymakers.